Be sure things are run your way day-to-day. No one knows the secrets of your business' success better than you. Share them with your franchisees in clear, easy-to-follow detail with our operations manual template. Included a special Restaurant Opening Template for guiding your franchisees through the crucial days of opening their location on time, on budget, and in compliance. Ensure consistency from one franchise to another as you protect your business' good name. Used by top franchise attorneys, franchise consultants, and hundreds of DIY franchisors, our template is best suited for food service and restaurant franchises. It features helpful "guidance boxes" that walk you through the process of making the manual entirely your own. 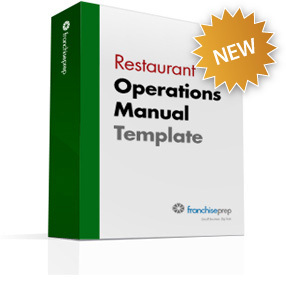 Restaurant Operations Manual - Chapter 8 Format and delivery Our operations manual template is a Microsoft® Word document that we make available to you for easy downloading immediately after you process your order. It's completely customizable and comes with thorough, easy-to-understand instructions and special "guidance boxes" that eliminate guesswork. Save $100. By upgrading to our Basic Package, you'll get our operations manual template plus all the other essential documents you need to launch your franchise at a savings of over $100 off the cost of buying these documents individually.